Luxury Home with Panoramic Ocean View in Rain Forest. 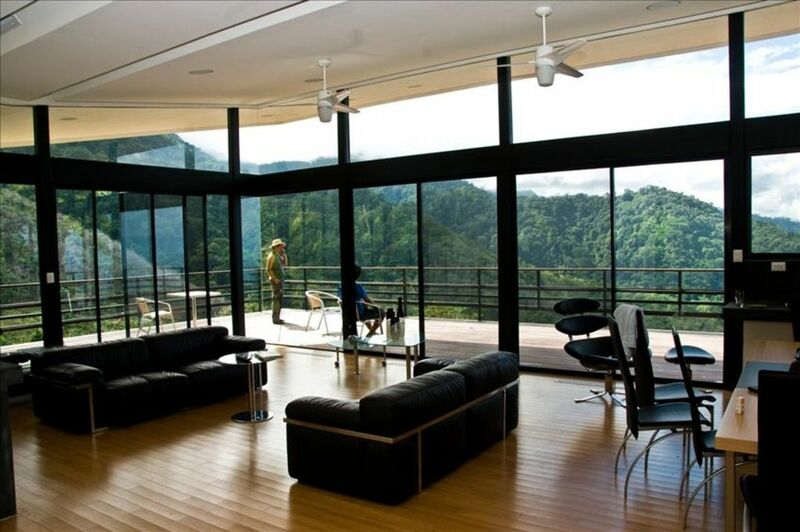 Beautiful luxury home within the rain forest with an almost 360 degree Oceanic/Mountain view. Keywords: Luxury of the city inside a mountain top forest estate with breathtaking oceanic views, several 100m waterfalls, waterfall pools, and large streams on the property. All within minutes from the most pristine protected beaches in Costa Rica, Playa Ventanas, Playa Tortuga, Playa Ballena and Playa Piñuela. Vacation/Rental Home for American Family. The town is quite, very friendly, peaceful Costa Rican town with all the amenities necessary for the perfect holiday getaway. The House is less than a 15 min drive to the beach and is just 2km from the most beautiful pristine beaches in the country. The property offers one to enjoy a breathtaking rain forest property that offers some of the most incredible sites (More than a handful of 100 foot waterfalls , rivers and hiking trails) in all of the South Pacific. Even the local Costa Ricans are surprised on visits to the property as it is truly one of a kind. This home is a destination on it's own! You know how, when you look at the photos of an advertised place, many times it doesn't really look like that when you get there? When we looked at the pictures of this house, we could not believe it could really be this great. But when we arrived? This place was far beyond our expectations. Glass everywhere! Glass in all directions. The mountains. The jungle. The ocean. Top of the world! Fantastic. I got up every morning before sunrise to listen to the jungle. You can hear Howler Monkeys in many directions. Toucans and many other birds. It's as if you are in the focal point. And it's all yours. Martin (Marteen), or on site concierge was there for whatever we needed. There's a swimming hole in the Quebrada Tortugrita (Little Turtle Creek), A refreshing place in the tropical jungle. There were Fresh Water Shrimp and lots of fish. (Take you mask and Snorkel). It was all ours! You can cook for yourself or you can go to town. Everywhere we went, the food was excellent with great value as well. I highly recommend this fantastic home. One of a kind experience at a one-of-a-kind location. The best of Costa Rica. You will never forget this place. The owner and his staff are completely available for your enjoyment. The view is spectacular and I doubt there is a place to stay that has a more awesome view than this. Every room has a breathtaking view. It’s even better than what is advertised. Highly highly recommend!! We had a wonderful stay. This place has an amazing view of the mtns and beaches. There is a few waterfalls in walking distance. Just gorgeous natural surroundings. We absolutely loved our stay and at this beautiful place. Can't wait to get back for a longer stay! Thank you Banti and Alendro! You guys provided an awesome experience. Great place, tucked away high up in the rainforest, where you feel like you have your own mountain. Great waterfall pool to swim in, other waterfalls to take great pictures. The house is so well nestled in the forest that you can see various kinds of monkeys, toucans, etc.. right from your front porch and back porch. If you're looking for a remote getaway, this is the place for you. The security guard was fantastic with helping and any kind of assistance, as well as, a great tour guide and surf instructor.